The shape of the gladiolus leaves gives it its name; they resembles swords, and the Latin word gladius, from which we get the word gladiator, also gives us the genus name for this tall, bold flower, a member of the iris family. It’s also sometimes called the sword lily. The flowers come in a wide range of colors, pink to red, lavender or purple with white, contrasting markings. You’ll also find them in white, off-white and cream, and yellow, through orange to red. With their relationship to gladiators and their swords, it’s no surprise that the gladiolus signifies moral strength, integrity and sincerity. They also represent infatuation, with the sub-text being that the heart of the giver has been pierced by the recipient. 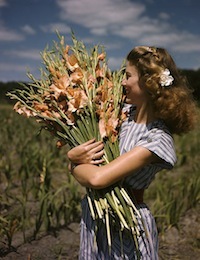 Appropriate not just for those with a birthday in August, gladioli are often given to celebrate friendship day, which occurs on the first Sunday in August. An alternative flower for August celebrations is the poppy, which usually symbolizes imagination when given. The common poppy’s blood-red color has often signified death, or eternal sleep, or to some the promise of eternal life after resurrection. The red poppy has also become a symbol of remembrance for war; the author remembers being a child in Great Britain, and wearing a red plastic poppy every November, to acknowledge those who fought for freedom in the two World Wars. Poppies also have happier and more upbeat meanings. They can be found in many colors, from light pastels to bold, solid colors, including white, yellow, orange, pink, red, and almost violet. The white poppy means consolation, while the yellow poppy wishes success and wealth upon the recipient. So now you know what message you’ll be sending the recipient when you gift them some August flowers, gladioli or poppies.